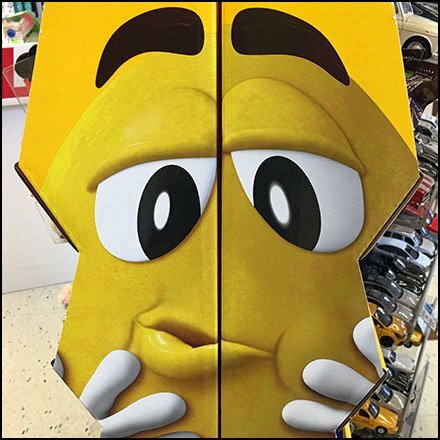 Visible by virtue of its sheer verticality and yellow color, this M&M’s Caramel Corrugated Tower Floorstand pitches the new “flavor” along with traditional M&M’s on its lower levels. Though carmel flavor, the mainstream Yellow character mascot (yes, they are named by color) is spokesperson on the side panel. Though a small footprint, just how much floorspace do you need to sell small packages of M&M’s, particularly in a Tower format? This M&M’s Caramel Corrugated Tower Floorstand seen at Weis.